A man takes a bucket of lobster off the Langostero III to be loaded into a truck. Puerto Yucalpeten, a vibrant fishing port on the northern coast of Mexico’s Yucatan Peninsula, is bursting with color, crowds of people, and the biggest lobsters I’ve ever seen. As part of the Gulf and Caribbean Fisheries Institute‘s annual conference, a group of scientists, fishermen, managers, and I were invited to the port to speak with some of the fishers firsthand, all of whom are a part of the Yucatan’s system of fishing cooperatives – organized fishing groups that exist throughout the region. As I stood on the deck of the Langostero III (named from the Spanish word for lobster), I watched in awe as a seemingly endless stream of the crustaceans, piled high in plastic buckets, were passed up from below. One of the men on the boat, his hands momentarily free between phases of unloading, told me more about the cooperatives in the area, explaining that they not only catch lobster, but also grouper and octopus too, depending on the season. 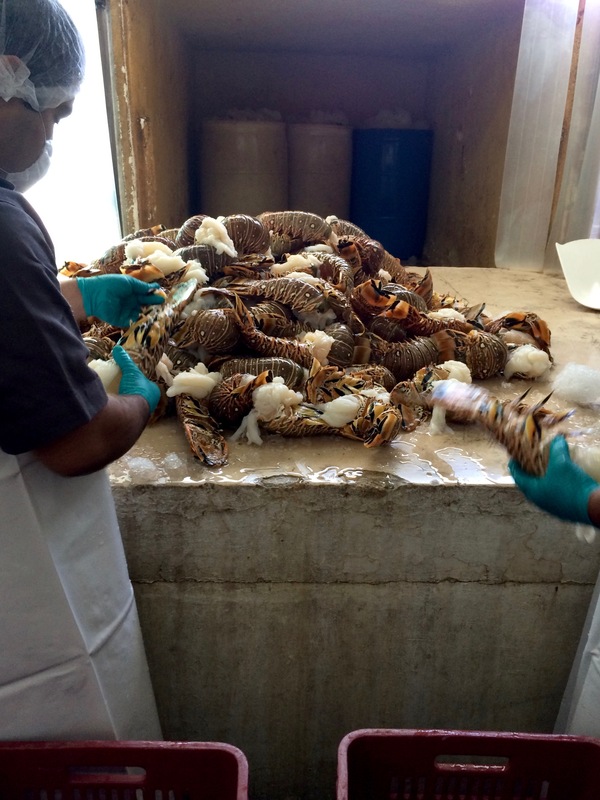 Men and women at the Progreso processing building sort and clean the lobster for packaging. Fishing cooperatives are groups of fishermen and women who coordinate their fishing practices within an area to collaboratively use, manage or distribute their catch. Cooperatives work together to further the shared goals of a fishery, which may include coordinating fishing activities, jointly managing a fish stock or marketing the product for sale locally, regionally or internationally. Often times, cooperatives are granted exclusive access to their fishing area by the local or state government, a type of security that also provides an incentive for cooperatives to manage their fishery sustainably. While fishing cooperatives exist in many places around the world, the cooperatives of the Yucatan are especially known for their success in promoting economic, environmental and socially-sustainable fishing practices. 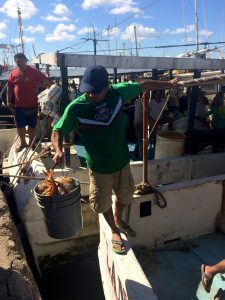 After visiting and speaking with several boats along the waterfront, our group continued on to a building in the nearby town of Progreso, where the lobsters were taken after being unloaded from the boat. There, they were weighed, cleaned and prepared for market. Small trucks full of the freshly-caught lobster backed into the building’s chilled entryway, where mountains of catch were released onto a cement block. 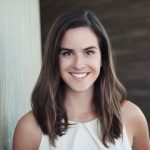 The lobsters were then sorted by weight, wrapped in plastic and packaged loosely into crates for their final destination – in this case, Cancun, where they were to be sold to the local market at $540 pesos/kg, or about $29 USD per lobster. 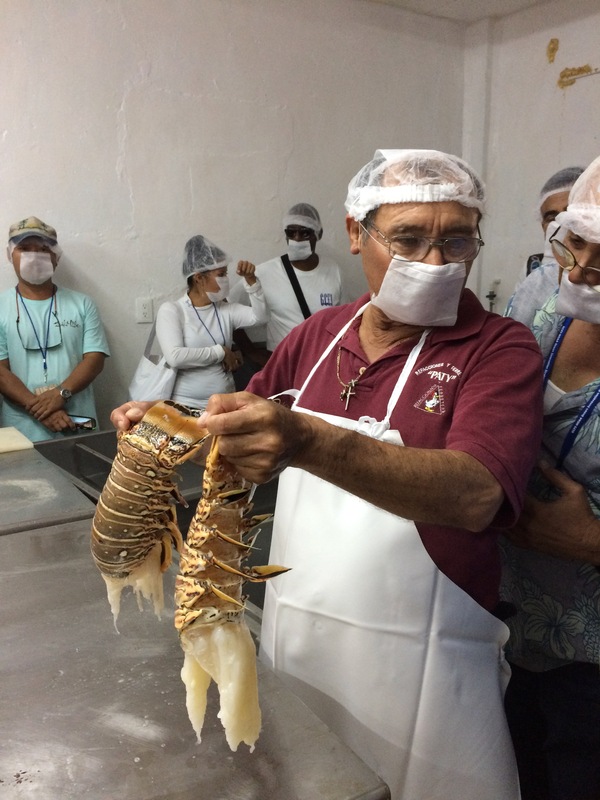 A member of a Yucalpeten fishing cooperative explains the market for lobster in Cancun. While the mountains of lobsters amazed me, the enthusiasm, commitment and strong knowledge of fisheries resources that the men and women of Yucalpeten possessed was my biggest takeaway from my visit to the fishing port. I am hopeful that fishing cooperatives, as well as other strategies for sustainable fisheries management, will continue to emerge and prosper. Additional background on fishing cooperatives was drawn from Environmental Defense Fund’s EDFish Blog.